Caravanning Tasmania with the family is an unforgettable experience. My family and I have just arrived back to what my youngest two daughters call Australia from a 28-day tour of Tasmania. What a whirlwind. This was our second trip across Bass Strait; the first time my three daughters were 3, 4 and 7, so that trip was more about mum and dad. This tour was for my daughters, now 6, 7 and 10. When you are in Beaconsfield, I highly recommend you take a short drive to Beauty Point and take a tour of the Platypus House. Here, you will not only see the platypus, you will get an up-close look at Tasmanian echidnas as they walk around your feet. Your admission fee includes a 15-minute movie all about the platypus, followed by a 45-minute tour with one of the friendly guides. Our provided us with a lot of information about the platypus that was easy for my daughters to understand. During the tour, you will see these strange animals swimming around, with lots of ‘wows’ and ‘cools’ coming from the children’s mouths. From there, you move on to the next room where you are greeted by some prickly little Tasmanian echidnas. When you see the smiles on your children’s faces as the echidna’s walk around them, you know it is money well spent. The Platypus House gets the thumbs up from the girls and mum and dad. After your visit to Platypus House, it is literally 10 steps away to Seahorse World. At Seahorse World, your family will get an educational tour around this working seahorse farm and aquarium. The tour starts with a short film about the different types of seahorses. After the film, your tour guide will lead you through the cave of seahorses. Our guide, Tegan, was very informative and great with the kids. Upon reaching the end of the cave, you will arrive at the seahorse farm where you and your children will be amazed at all the separate tanks full of thousands of seahorses. Here you will learn the life cycle of the seahorse and how they farm them. My girls loved the three tanks that Tegan explained as ‘a primary school, a high school full of teenagers, and a university’ for seahorses. From the farm, it’s off to the aquarium for a close look at the marine life of the Southern Ocean. Then comes the highlight of the tour, and my daughters’ favourite part, where you get to pull your sleeve up and reach into a tank full of seahorses and hold one of the most mysterious creatures of the sea. That alone was well worth a visit. Seahorse World gets a 10 out of 10 from my family. The Beaconsfield Mine and Heritage Centre is a short walk from Beaconsfield town centre and the site of the April 2006 mine rescue of Todd Russell and Brant Webb. 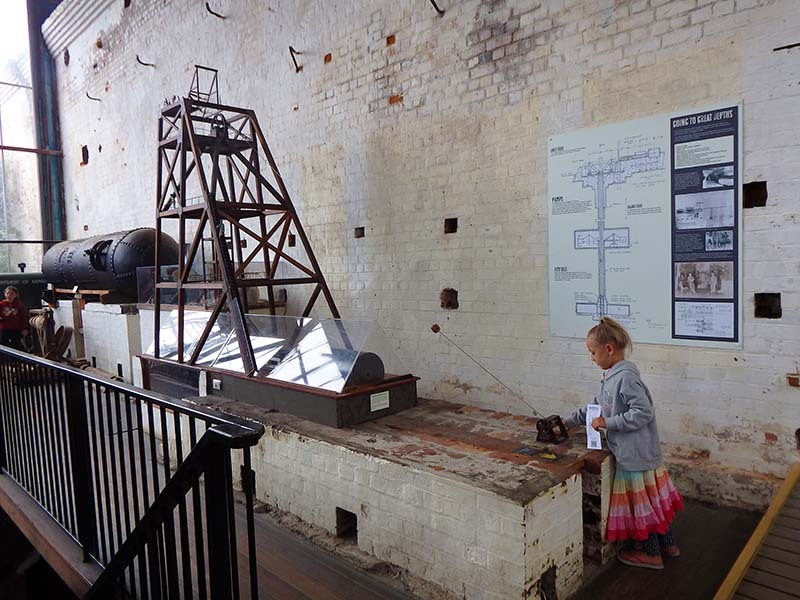 The Mine and Heritage Centre is a great place for the family. It has heaps of hands-on things for the children to play with and lots of history and information for mum and dad. The centre also has a great display of the mine rescue. When you arrive at the centre, you will be greeted by one of the friendly volunteers. The children will be given a pencil and a list of animals hidden around the centre that they need to find. Allow a few hours, not only to find the hidden animals but to take in all that this great place has to offer. By the way, if you find the bat be sure to let me know where it was. Well done to everyone at the Beaconsfield Mine and Heritage Centre – a big high five from the Rawlings family. From Beaconsfield we made our way to Burnie. Here, there are two things you must do. One of them is to meet the makers of Burnie. Meet the Makers of Burnie is conveniently located in the same building as the Burnie Information Centre. At the information desk, you can purchase a ticket for the paper making tour. On this tour, you will learn the art of paper making by hand: your children can get their hands wet and dirty and make their own paper with the help of one of the experienced paper makers. After learning how the paper makers of Burnie make their paper out of everything from recycled jeans to wombat poo, and making your own paper, you can take a unique sheet of paper with a watermark of a Tasmanian animal home with you. It makes a great postcard from the children to someone special. We had a wonderful time making paper with the paper makers of Burnie: 10 out of 10 for fun from my girls. Your children will absolutely love seeing little penguins coming back to shore from a day of feeding at sea. The Burnie Penguin Centre is located behind the Burnie Makers Centre. The penguin viewing begins at dusk every night from October 1 to March 31. The penguin viewing is under the guidance of Friends of Burnie Penguins, a volunteer coast care community group. If you arrive at sunset you will learn all about this amazing little bird from one of the volunteers. Then, about 9pm during the summer months, the guides will walk around with you and you will get a close look at the penguins in their natural environment. They ask only for a donation for their time. Thank you to the Friends of Burnie Penguins for a truly memorable night. Bicheno is a great town in Tasmania where you can observe the natural behaviour of the Tasmanian devil after dark. Devils in the Dark Bicheno is a tour during which you will see the devils in their natural environment. You will witness devils eating and fighting for food as they naturally do, from the safety of a glass wall. It is a one-of-a-kind experience that you will never forget. Devils in the Dark is recommended for children over seven, as you do see devils ripping apart and fighting over whole kangaroo carcasses. You also hear the crunching of the bones as the devils eat. If you’re travelling with dogs, Bicheno is a good place to base yourself for an exploration of Freycinet National Park. It’s a short drive from Bicheno to Freycinet National Park, where there is heaps to do. The view of the crystal-clear water and white sandy beach of Wineglass Bay from the lookout is breathtaking (the walk up is a little too) but, all jokes aside, it is a tremendous sight. If you’re looking for free things to do in Hobart, a visit to Tasmania’s capital city would not be complete without a trip to the Salamanca Market. It’s a great day out for the whole family. With its waterfront location and plenty of Tasmanian produce and craft, it’s a good place to sample some local goods and get a bargain on a souvenir. The Tasmanian Museum and Art Gallery is a place where you can keep the kids entertained for the whole day. It’s a place where they will learn and discover with a heap of hands-on and interactive programs. There are also lots of exhibitions about the history of Tasmania. Mt Wellington is the backdrop to Hobart. You can drive to the summit of Mt Wellington on Pinnacle Road any time, though access may be restricted over the winter months due to snow or ice. It’s a short drive to the summit, which offers the best views of Hobart. When you get to the top, if your car has an immobiliser, don’t park too close to the tower like I did… when I went to leave, I couldn’t start my car. So, with the help of some amused onlookers, I had to push the car down the car park away from the tower to get my car started. Taranna is an hour’s drive from Hobart and there you will find a unique zoo. Unzoo is a zoo without boundary fences, which allows the local wildlife to come and go as they like. At Unzoo, the guides run animal encounters every half hour. During these encounters, the guides tell you all about the animals. Unzoo is also the best place around Hobart to see the Tasmanian devil. For my daughters, the highlight was hand-feeding the kangaroos and pademelons. Another highlight was the Birds of the Bush Show in which one of the birds took a coin from my daughter’s hand and returned the same coin back to her at the end of the show. Unzoo also gives you a chance to come face to face with a Tasmania devil in its underground dome. The whole family will have a great day at Unzoo. Ten out 10 for fun and 10 out of 10 for value for money. The Tahune Airwalk is about an hour’s drive from Geeveston through the Arve Forest on a sealed road. Of all the things we did in Tasmania, the Tahune Airwalk was the most fun had by the whole family. There are four short walks in the Tahune Forest Reserve, with the pick being the Tahune Airwalk. It’s an easy 50-minute return walk that takes you high in the forest canopy. The airwalk ends at the cantilever, which provides a spectacular view to where the Huon and Picton rivers meet. With an elevated height of 597m, it’s not for the fainthearted, but there are three more great, short walks: the Huon Pine Walk is 20 minutes return, Swinging Bridges is one hour return, and the Huon Track 1.5 hours return. But it’s not all walking at the Tahune Airwalk. It’s also home to the Eagle Hang Gliding. 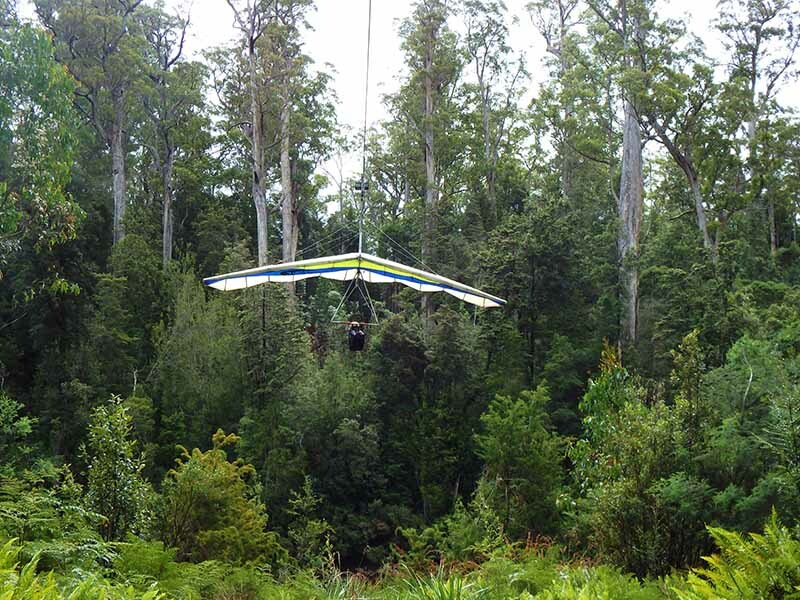 The Eagle Hang Glider is a cable hang glide over the forest floor, 250m across the Huon River where you stop 50m in the air. After a short pause and a quick look down, if game, you glide back down with the wind. With all my children meeting the 25kg minimum weight, it was a thrill that the whole family got to enjoy. After a thrilling day of walking and gliding over the Huon River among the giant trees of the Arve Forest, it was time to sit and enjoy some Tasmanian food while the girls made the most of the free wi-fi. By that time we had finished doing everything the Tahune Airwalk had to offer, it was nice to know that we did not have to leave this beautiful place just yet. As it turned out, the purchase of your ticket to the Tahune Airwalk also includes up to three nights of camping in the overflow car park. So by about 5pm, we found ourselves in this beautiful forest. I highly recommend that you don’t leave Tasmania without a day or two spent at the Tahune Airwalk. Thank you Ian and Tracey for making our trip to Tasmania unforgettable. The Tahune Airwalk gets a big ‘yes-yes-yes’ from our family. Price: adults $15; concession $12; children (5-16) $5; family of two adults and two children $38. More information: www.beaconsfieldheritage.com.au or (03) 6394 4454. Price: adults $22; concession $19.80; children (4-16) $9.50; family of two adults and two children $55. More information: www.seahorseworld.com.au or (03) 6383 4111. Price: adult $24.50; concession $22; students (17 years old-plus) $22; children (4-16) $10; family of two adults and children $59. More information: www.platypushouse.com.au or (03) 63834884. Price: adults $15; children (5-14) $8; concession $12; family of two adults and two children $40. More information: makersworkshop@burnie.net or (03) 64305831. More information: www.devilsinthedark.com.au or +61 0401 246 777. Price: adults $29; concession $26.10; children $14.50; family of two adults and two children $58. More information: www.tahuneairwalk.com.au or 1300 720 507. Price: adults $18; concession $17; children $16. Weight limits: 25kg minimum, 120kg maximum. Prices: adults $33; children (4-16) $18; family or two adults and up to four children $79. More information: www.tasmaniandevilunzoo.com.au or 1800 641 641.